CARDZ TV: LET'S MAKE HALLOWEEN CARDS & STAMP SALE! Hi guys! Today I've got 2 cute Halloween cards for you, made using papers and die cuts from the Cardz TV October card kit "Happy Halloween", glitter ribbon from the Dollar Tree, and Cardz TV Stamps "More Spooky Sayings" and "Banners and Bubbles"! Thanks for watching! 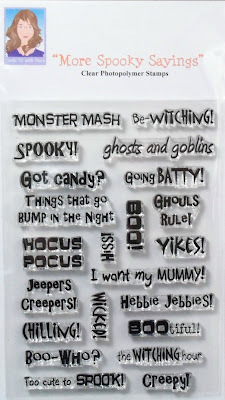 I have your sketches, Mary, and Spooky Sayings stamps. So I’m ready to recreate your cards today! Thanks so much. Love these cute Halloween cards! Thanks for sharing.